Amanda has a passion for colour and texture. A degree in Woven Textiles developed an intuitive understanding and response to the tactile nature of textile materials. She has developed a way of working which gives freedom beyond the restraints of woven fabric, using threads to draw images and integrate texture into the surface of fabric and paper; combining drawn and painted marks with the tactile qualities of threads and fabrics. Amanda aims to capture the essence of the landscape and natural forms which influence her work. Drawing is used to record a sense of moments experienced, capturing fleeting fragments of the landscape which are observed and absorbed as she moves through it, looking at the familiar, seeing the extraordinary; responding to the subtle changes of view in the rhythmic motion of walking. Amanda explores the evocative moods of seasonal change and atmospheric qualities of light and changing weather. After a career in art teaching Amanda extended her textile practice through study with The Opus School of Textile Arts Master Class course ‘for experienced makers who wish to develop their individual creativity in a practical way.’ This study has a great impact upon her work and teaching in terms of the exploration and development of creativity and empathy with students in their own studies. Amanda is a member of Prism textile exhibiting group showing work at The Mall Galleries, London. As a member of Oxfordshire Craft Guild she exhibits work in a range of venues throughout the year. She exhibits at SOTA Gallery in Witney and takes part in Oxfordshire Artweeks. 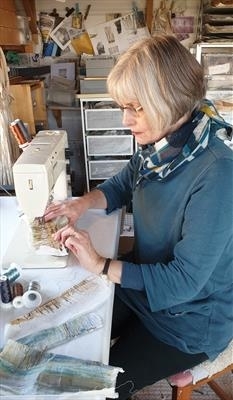 Amanda is an established tutor at Oxford summer school, Ardington School of Crafts and Art Van Go offering dynamic workshops designed to teach the textile processes used in her working practice drawing on the personal creative energy of individuals. The scale of work ranges from large individual hangings to small wall mounted panels and framed textile artworks. Amanda welcomes work to commission and is happy to consider invitations to give talks and workshops.